This is the speaker with the ion2 on top. I have been using this for a day and I must say, it’s a very good piece of gadget you can use for your iPod, I cannot say that the price is ok, but the sound quality is good. Holding this item alone has a very good solid feel and the quality of the plastic looks good! All I can say is that this is just your basic iPod speakers as you may not want to wear earphones in your room. The remote control is very small and has a sleep and mute button. The only problem I have with the sleep button is that it does not pause the iPod, your iPod will continue playing but the speakers are off. It actually felt like the mute and sleep buttons were the same. The remote control only has volume, bass and treble controls. The unit has only one (1) blue LED which blinks when you try to change the volume. 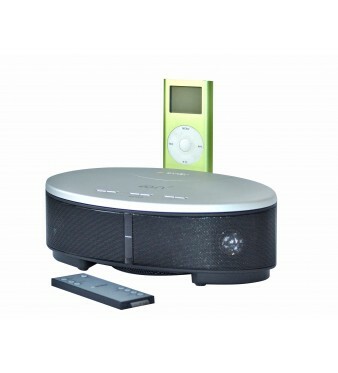 This speaker does not have a separate control for the iPod therefore, next song and play and pause options will be pressed on the iPod’s click wheel. It also has a adapter for the iPod video and Nano only, you will need to stick some kind of a foam if you will use a Nano, the problem is that the foam has an adhesive and you may not use a Video again if the foam is already installed. You can have the adapter removed just in case you have a older iPod but the only thing holding your iPod is it’s connector, might not be a good idea since a gentle tap might destroy your iPod’s connector. I am going to recommend this item to those looking for good iPod speakers, I know there are others out there in the market which are cheaper and maybe better but this is something you can keep as an option when looking for that additional accessory for you iPod.